Basque Country is well-known as the home of foodie paradise, but it’s also the perfect spot for an adventure-filled weekend. For a unique weekend full of culture, food and waves, it’s a perfect place to spend 48H or longer. The Basque Country proudly calls itself different from the rest of Spain, and once there, you can easily notice why. From the beginning, its own language called Euskera and endless gastronomic delights, from a dramatic scenery to a modern architectural landmarks; you will surely be impressed by the hidden gems the Pais Vasco has to offer. Our road trip started on Friday evening after long day of work. We took the car and drove non-stop to Getaria. It’s a small town on the Basque Country coast. In order to get there, we left Andorra to reach the plains of Lleida, wich where located at the foothills of the Pyrenean mountains.The road continues near Huesca and then you start to enter the Basque country. The entrance in to the Basque Country is noticeable because all the road panels are written in Euskera and Spanish. We arrived to Getaria as expected, around dinner time. We decided to unpack our baggages quickly in the Airbnb apartment and search for a place to eat. The next day, we woke up early to have breakfast and drove to Hayedo de Otzarreta. The trip to get there was an hour long filled with nice roads, great views and small Basque towns. The final stretch is by a road that goes through the forests and green pleasant meadows. You need a GPS to arrive to the area without any problem. After that, we decided to improvise a little bit our plans as we finished earlier than expected. We saw that Vitoria-Gasteiz was very close to this place, so we decided to have breakfast in the city. After a delicious breakfast in “La Cafeteria” (I recommend it for their nice cakes), we went to the centre of the city to visit the old town. At this period of the year, in winter they usually put some winter activities in a big place near the 2 principal churches. We saw people going ice-skating, ice slides and other activities. 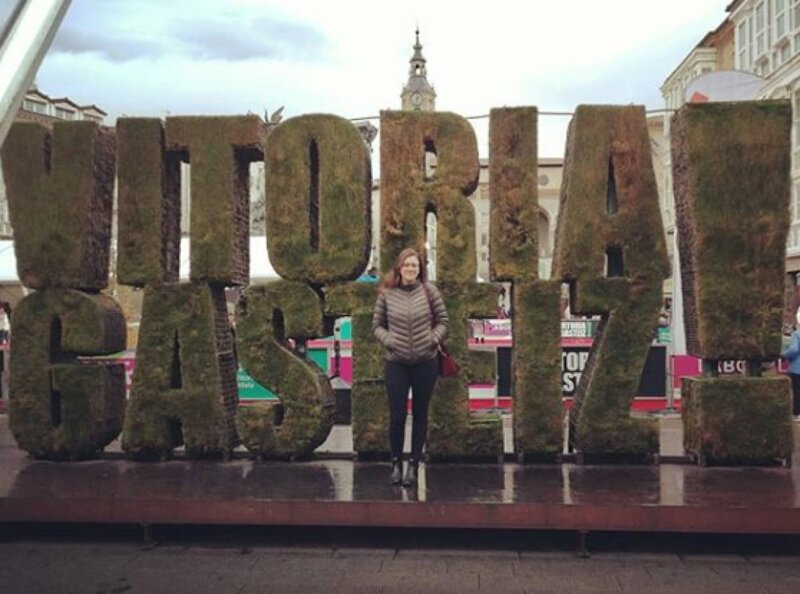 You can find them at the same place where the big letters of Vitoria-Gasteiz are (see more in our video at the end of this blog). It was time to go back to our apartment in Getaria, but not without stopping in Zumaia first, wich is a must in the Basque Country for its cliffs and flysch: a unique stone formation on the coast, as you can see on pictures. We had some free time before the sunset, so we decided to eat something in Seizortzi Bar. The weather wasn’t good but it wasn’t raining, so we were able to take some great pictures and film a little bit. Finally, we arrived in Getaria, and we searched for a “pintxo-pote” bar/restaurant. To our surprise, we found an area full of them and with a nice ambient. For such a small town, you could find a lot of people in the small street, eating outdoors or standing up. We enjoyed the good food from the Basque Country. The last day, we drove from Getaria to San Sebastián before coming back to Andorra. This is a last picture of Getaria. We drove directly to San Sebastian and to our surprise the sun came back and it offered us a good moment of warmth just arriving to the city. We enjoyed walking in the old town of San Sebastian but after that, the rain started again. But it wasn’t an excuse for the Basque people to enjoy a Sunday outdoors as we could see people dancing folk music in a square and people enjoying the Ferris wheel and other carousels next to the maritime walk. “la Playa de la Concha” is such a beautiful place even when the weather is not at its best. Finally, we had to take the car to come back to Andorra, but we knew we would come back again to the Basque Country because we didn’t have time to visit some of the other places and cities. The food was so amazing and the landscapes so wild that we are thinking of coming back again in a near future. This is the video that recaps our road trip. I hope you will enjoy it as much as we loved the Basque Country. If you have the opportunity, don’t hesitate to visit the area. VERY RECOMMENDED!! !